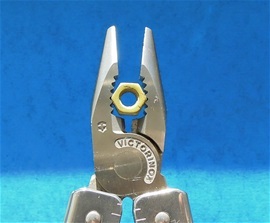 In 2002 Victorinox changed the pivot on the SwissTool plier. On the picture are one 1998 type and a 2002 type on the right in black oxide. There is also a type in between these two but the most important is the 2002. This got to do with the forces working on a plier in clockwise and counter clockwise motion. This information is already on the internet to be found. What is important to know is that I do believe this got to do with the Victorinox constant quality improving. The maximal amount of force it takes for breakage and so on. There are also some anatomy changes on the plier design. My best advice is to try it out and take notice on the cut section of the pipe opening that can be used to turn nuts and bolts as well. This section with cut area does fit the edge on this nut better so you may have a better performance. This depends on how experienced you are with the tools. The wide jaw gap is also interesting on the 1998 type compared to the 2002 edition. This is not necessarily any problem because it does not affect functionality. There is a limit for how huge a bolt that could be turned and so on. 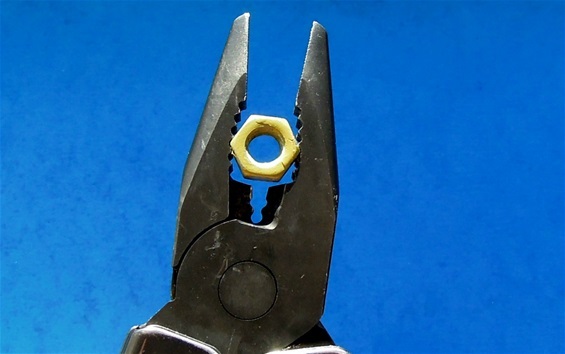 The little nut on this page is nothing for these pliers. The 2002 plier may be more balanced than the 1998 type but for sure I have never had any problem with the 1998 type and I consider it one of the best. 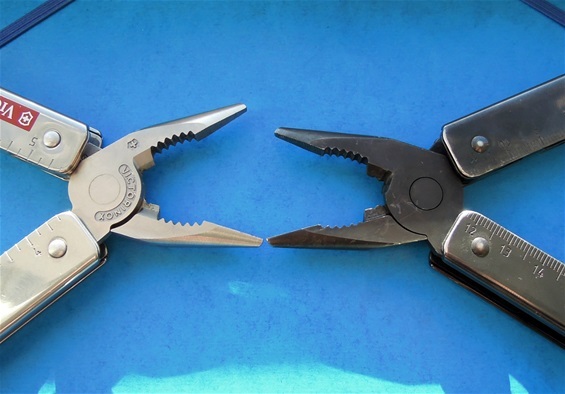 You will also find variations on the pliers with the wire cut area on the same type of plier. 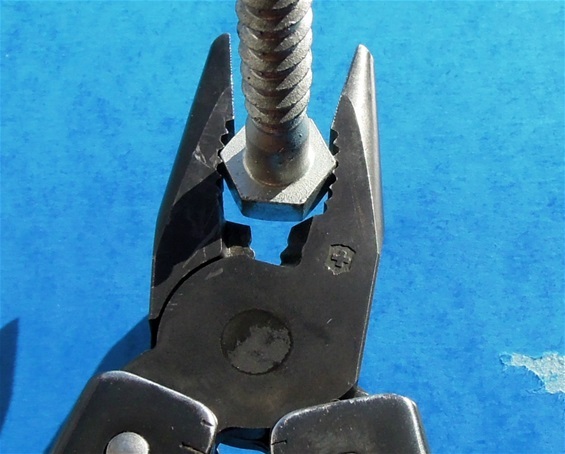 You may find a 1998 type plier with no notch for hard wire cutting and so on. It is a cut part just no notch for the hard cutting. 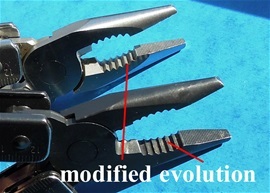 There are a few more variations than the evolution of the pliers we know. using the wide gap on the 1998 fully would not be balanced vs. some factors. The SwissTool pliers are absolutely one of the best in the world if not the best.The 2002 also got the more distinct wire hard cut design. 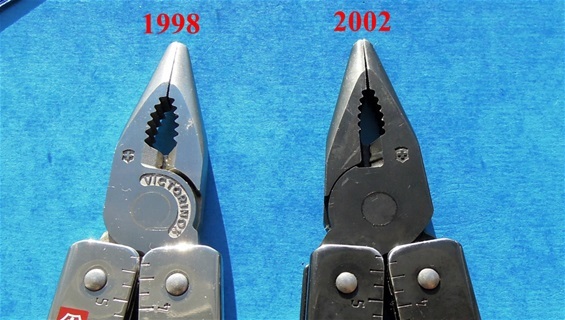 Take a look on the 1999 type plier that you can find on the internet as well! By altering the cut teeth on the plier you may strengthen the abilities for the plier. The lowering and modification done by Victorinox may enhance the abilities for using it on bolts and nuts. This is how I see it. The edges also fit better like I have shown. It is obvious that when using it for such tasks that the problem will slip is present. In such cases it is possible to damage the cut parts. The modification done may be because of this and for functionality. On the pictures you can see how the two fit a large bolt. The 2002 fit very well. I do how ever feel that the 1998 even with not as good fit locks the bolt head very well. I do believe that they are pretty even here. The fit is super natural on the 2002 for sure that said. On the models with black oxide you see here how important it is with the minimal buildup. This is an advantage with the black oxide layer and on this it is worn very much so the buildup is not there at all. 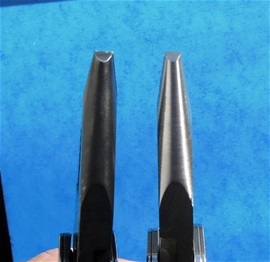 The depth of the cut parts would be the same on a 2002 polished one. I would again like to mention that the 1998 type is top notch and remember to use a secure grip when turning a bolt so it does not roll. I do not have a 1999 type plier to show you. Anyhow on the 2002 the tip is wider and more sturdy than on my 1998. If you read my pages then you will find my talk about the hybrid design. It is what i call it. The 2002 is even more a hybrid. Not any of these can be called a needle nose. They are a hybrid in my mind. On this picture you can see the 2002 compared to the one i believe is the 2005 model. It is a beast! This one on the picture has never been used because it is in the collection. I have knowledge about this because i have used one before that i gave away. It is a very good plier but i am far more used to the 1998 type and that is the plier i like the best. In the history of multi-tools we got he development on making the strongest pliers possible for a multi-tool. Victorinox took this to the next level for sure. There is also a type after 2005! It is part of the constant development i did mention. Because i am more used to the 1998 type i have no problem at all with it. What i can say is that the 2002 and 2005 type plier gives more power and stability when using it because of the development. I have no problem getting a very secure grip with the 1998 one and the cut parts can grip a bolt or nut very well. The difference is when turing clockwise and counter clockwise. It is not just that the 2002 and up it can take more before breakage it helps the grip for more power. I recommend reading about them. It is very interesting with the clockwise vs counter clockwise with the jaws as well. This you can read about on the internet and let me know Your feel about it and if you agree! I have applied force on the 1998 types and i can not see any problem yet. The design on the 2005 plier reminds me of some lines you would find on modern stealth designs. It is cool! The plier on the Swisstools must be the best developed ever. The plier is short with a rather long handle. The dimensions are very sturdy thus making it possible to apply some incredible strength on the handle. Then it is possible to grip with serious force on a device. 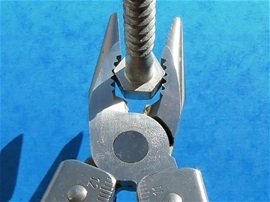 The SwissTool pliers cannot be compared to the needle nose design on the Wenger 130mm knives but this was never the idea. They are both very good for the tasks they were made for.